The latest Instragrammable addition to The Palace complex, this trending spot is frequented by those who enjoy hip-hop, trap, and pop music in a laid-back atmosphere. Short for “breakfast all day,” B.A.D. serves comfort and breakfast food by executive chef and all-around cool guy, Mikko Reyes. Popular among college students and yuppies for the affordable bar selection and finger-licking grub, this late-night breakfast bar has become the top-of-mind choice as the first stop for a fun night out or to eat and dance until the sun comes up. Like all good speakeasies, Bank Bar’s hidden entrance (you have to go through an inconspicuous door from within a local 7-eleven) leads you to a high-ceilinged, hip loft-inspired drinking den where you can enjoy bespoke cocktails, and what is hands down one of the widest selection of spirits in Manila. From akvavit to absinthe, sake to single malts, grappas to gin—an impressive podium of choice bottles lights up the bar. As music specially curated by Anton Ramos plays, two trolleys rove the floor; one for small-batch crafted cocktails, the other for tableside gin and tonics. And if that isn’t enough, the small plates served include the likes of chicharon bulaklak with pork floss, baby squid calamari, chicken skin chicharon, and even sister establishment Manam’s house crispy sisig during happy hour. Located on the 27th floor of Diamond Hotel Manila, this swanky bar boasts a stunning view of the vibrant cityscape. Have a go at any one of the 27 signature cocktails this sky-high spot offers, from the tequila-based Manila Bay Sunrise to the rum-based Hasta La Vista, while moving to the groove of live musical entertainment. The assortment of classic tapas is best shared with good friends and a good drink in hand. Reminiscent of an old Cuban cigar factory, this is the place to sit back and smoke a nice roll of tobacco while sipping on your favourite whisky. The dimly-lit cobalt blue and dark brown interiors evoke an inviting vintage vibe, attracting a refined bunch for after-work drinks. Order cocktails that ring of Latin American passion, such as the El Presidente No. 1, a mix of white rum, pineapple, and lime juice or the Vesper Martini, agent 007’s favourite cocktail, using gin, vodka, and Lillet Blanc with a lemon twist. This fun neighbourhood watering hole is a common hang out spot for after-work pints and tipples. Whether you’re a sports fan or a music lover, this pub’s got you covered—from streaming live football games to hosting quiz nights once a week and a hot DJ line-up. Grab a colleague or two and blow off some steam while sipping on your favourite cocktail or an ice-cold pint on tap. Looking for a place to kick back and enjoy good wine with great company? Located in the vibrant neighbourhood of Poblacion, this wine bar has become a staple for many a wine enthusiast. With a nice selection of cold cuts, cheeses, and pâtés to accompany your pour, you can wine-all-you-want for the happiest hour of your day. Take happy hour into dinner at The 3rd Floor Private Lounge, where you can host your own intimate wine dinners and events. Step into the tropics and rock the night away with feel-good music and affordable cocktails. With nine different concepts (three of which are food outlets), The Island offers something for everyone. From the Rum Jungle’s tiki bar to the Smoking Hut’s barbecue-style grub, and the neon floaties all around, you’re sure to have a great “night out at the beach” with your best buds. Hidden behind heavy woodenwardrobe doors in Legazpi Village’s neighbourhood pub (The Belle & Dragon), Mandalay is an East-meets-West speakeasy where you can luxuriate in cigars and a large whisky collection from around the world. Escape to a different reality in this smoky den and enjoy good conversation all while listening to jazz and Motown classics playing in the background. Hope you aren’t afraid of heights! Grab a drink and take in an amazing view of the Manila skyline at one of the newest hot spots in town. Occupying the 60th to the 62nd floor of Grand Hyatt Manila, this whisky bar, grill restaurant, and music lounge sits atop the highest structure in Bonifacio Global City. Inspired by penthouse living with the cosy ambience of home, The Peak‘s fine wines, rare whiskies, live entertainment, and expertly prepared cuisine make for a unique journey for each guest. Get into the spirit of the roaring ‘20s with this lounge’s Gatsby-inspired art deco interiors. The black walls, pillars, and even the glass tables are accented with golden geometric metal frames, and when dusk comes, the yellow lights turn on and you find yourself seated in a golden room overlooking the Ayala Triangle Gardens. A refreshing night breeze flows through the al fresco sweet spot making your cocktail-sipping most enjoyable. This chic gastro pub tucked away in the hip neighbourhood of Poblacion is the go-to for everybody who loves craft beer, curated cocktails, and a mixed bohemian, yuppy, and millenial crowd. Originally intended as a tasting room for Engkanto Brewery, the owners opted for a more elevated experience, and incorporated their craft beer varieties into their food and cocktails. From the chef Luis de Terry’s global bar chow menu, including a lagered gambas al ajillo to straight mixtures such as the bourbon IPA, and beer turned into foam for the Polilya Fire cocktail, Engkanto craft beers are definitely the stars of this bar. Leave the world behind and enter a place of lavish delight at one of Manila’s most popular luxury clubs. Offering 6-star VIP service, top shelf liquor, and the most in-demand DJs, this upscale joint is frequented by the city’s finest as well as the discerning, party-loving tourist. Plus, if you’re looking to go clubbing with your girlfriends, every night is ladies night at Revel! Raise your glass if you love gin! 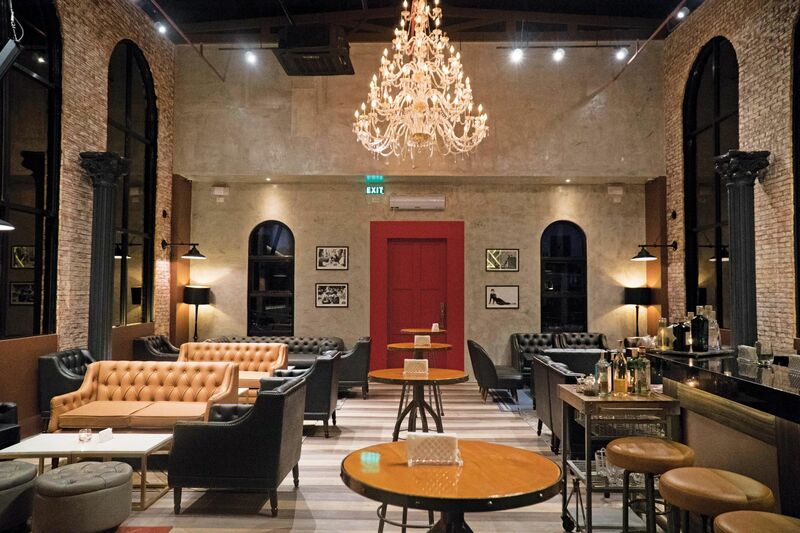 A recent venture from the people behind Unit#27 Apartment Bar + Café, this upscale lounge in Bonifacio Global City’s Uptown Parade has a Brooklyn-inspired vibe. The characteristic bold red doors open up to a space used as a live recording studio by day and an intimate lounge that comes alive with curated live music acts by night. Enjoy the masterfully crafted gin cocktails and premium gin offerings with a different sound experience each night: original music nights, contemporary cover bands on Wednesdays, Thursday jazz lounge acts, and DJs featuring live saxophone or electric guitar acts on the weekend. For all the party animals out there, this ultimate super club at The Palace brings the Manila nightlife scene to new heights. Home to recognised DJs Ace Ramos, Mars Miranda, Martin Pulgar, Marc Naval, and Kat DJ, Xylo’s multi-coloured kinetic neon lights, vibrant interiors, and cutting-edge tech rules the nightclub scene. Here, you can dance like nobody’s watching when show-stopping international DJs rock the decks! Named in reference to ‘90s pop culture, this quirky, throwback-esque bar prides itself on its bespoke cocktails crafted by Erwan Heussaff. Paying homage to a time when frosted hair tips were all the rage, “Yes Please,” which refers to a Magic 8-Ball answer, blasts RnB, pop, and house music from the ‘90s and ‘00s all night. Complete with “clean” graffiti, neon lights, infinity mirrors, and a foosball table, this is the place to go for those days when you don’t feel like clubbing but need a seriously good drink. A mix of revived classics, playful original creations, sophisticated mocktails, and speciality homebrewed infusions; the libations at Edge (by head bartender Lennon Aguilar) are a sip of contemporary mixology. To accompany the creatively crafted cocktails, a curated selection of bar chow by the Executive Chef Luis Chikiamco is inspired by a world of flavours: Catalonian, French, Japanese, Latin American, and Korean. The showcase dishes and innovative drinks cater to ever-evolving palates. Here, luxuriate in cocktails and canapés as the sun sets over Manila Bay, the sky turns pink at dusk, and the city’s lights shimmer throughout the night. On the 10th floor of Raffles Makati sits the Mirèio Terrace rooftop bar, an extension of its Provençal- inspired upscale brasserie and namesake, Mirèio. Born of traditional French and Mediterranean influences, guests at the Mirèio Terrace can indulge in champagne and signature cocktails with savoury hors d’œuvres while taking in the spectacular scenery of Makati’s cityscape. Located a hair’s breadth away from the tables of Solaire’s lavish Sky Tower, dark wood, leather furniture, and subdued lighting sets the mood at The Macallan Whisky Bar. Exclusive to the resort’s VIPs, the swanky bar is a cross between a traditional Scottish manor and an old world gentleman’s club— unassuming, yet unspeakably classic. Glass shelves at the bar are stocked with some of the world’s finest whiskies (it is, after all, named after one of the leading distilleries in the world), but one can also indulge in their house signature libations. Pair your tipple with a luxurious hand-rolled cigar stored in their humidified cedar lockers. A warm and lively place to gather for happy and after-work hours, this bar offers free-flowing local and imported beer, unlimited rounds of cocktails, endless top ups of red and white house wine, as well as other house pours. Pair your drinks of choice with a complementary chef’s snack platter featuring pub favourites and enjoy the live music in a relaxed lounge setting. Travel back to the ‘20s Prohibition Era (this time with zero prohibition) at Shangri-La at the Fort’s ultra chic speakeasy. The upbeat jazz tunes, dark wood and black marble interiors, and fully stocked gin bar (there are over 150 variants of the spirit) take you to a different time. The cocktail menu by Executive Mixologist Ulysse Jouanneaud brings gin-, whisky-, and bourbon- based cocktails to life. Grab a bite off the menu that features irresistable bar chow with an innovative flair.